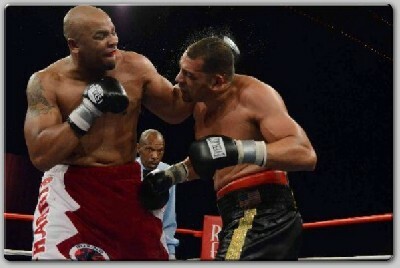 A most patient Maurice 'Mo Bettah' Harris, fighting a slow paced punch and hold war with Derric Rossy, finally dropped Rossy to the canvas midway through the 12th round and battered Rossy senseless on the ropes to score a TKO at 1:35 of the 12th and final round to retain the USBA heavyweight title. The bout was the main event of a four bout card Saturday at Resorts Hotel Casino Superstar Theatre, Atlantic City, New Jersey. The card was the first promotion for Carla Hill, wife of former world light heavyweight and cruiserweight champion Virgil Hill. Bouts were broadcast live on gofightlive with top notch commentary by Marc Abrams. Harris, 26-15-2 (12), East Orange, New Jersey, who knocked out future champion 16-0 Siarhei Liakhovich in the ninth round in 2002, went into the 12th round for the second time in his last three fights, and scored the latest stoppage in his 42 bout career stretching back to 1992. He has been putting his career back on track since signing with Dr. Mario Yagubi and Boxing 360 in late 2009. 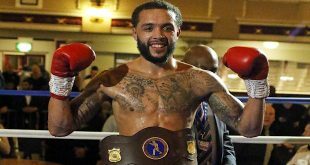 A hot and cold fighter, his career highs have included losing a ten round split decision to Larry Holmes, winning an eight round decision over 18-0 David Izon, winning a ten round decision over Jeremy Williams, and winning Thunderbox Heavyweight Tournament final in Atlantic City. His career lows have included losing to Tye Fields, Henry Akinwande, Fres Oquendo, Chris Byrd, Gerald Nobles and Vaughn Bean. Rossy, 25-6 (15), Medford, New York, won the first three rounds with a pattern of throwing single shots, grabbing and holding in center ring. Harris started rusty and showed little offense in the early going, but fought clean the whole bout once he got started. Rossy fought extremely dirty all night, hitting behind the head, throwing occasional low blows, and using kidney punches behind the back on every clinch initiated at every opportunity. Rossy should have been penalized for his tactics-taking advantage of short referee Earl Morton, who has a very small frame. Morton could not see a lot of details, and could not separate the holding and dancing by the two waltzing fighters-which looked more appropriate for the Resorts Hotel Casino 'Boogie Nights' Nightclub across the hall. Simply put, small Morton appeared to be the wrong sized referee for this bout. In the fourth, a short right by Harris caused one of Rossy's gloves to touch the canvas, called a knockdown for a 10-8 Harris round, keeping the bout close on the scorecards. 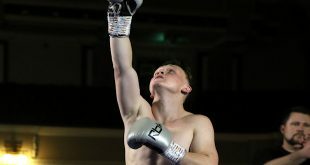 Harris also won the fourth and the sixth rounds with single punches and uppercuts, showing more aggressiveness. Rossy won the fifth and the seventh rounds, throwing single shots and then holding. The eighth and the tenth looked even. Rossy won the ninth, while Harris came back to win the eleventh by landing power shots. The holding was monotonous, and the slow rounds appeared difficult to score. After a long minute in the last round, Harris landed a left hook which dropped Rossy on all fours in a corner. Rossy beat the count, then leaned against the ropes and waited for Harris to leave the neutral corner, come across the ring and decide the contest. 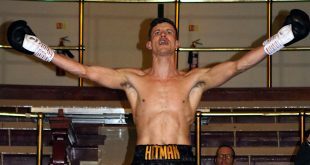 Harris reached inside himself and threw everything he had left at the defenseless Rossy, who then took an immediate senseless and brutal beating of head shots before the referee stopped the contest at 1:35 of round 12. Harris explained after the bout "I stayed patient. He (Rossy) was outhustling me in the middle rounds. You have to show you have something left in the later rounds." Boxing 360 promoter Dr. Mario Yagubi noted on the post fight interview he will be exploring European heavyweight bout options for Harris coming up later this year. World champions in the house included former undisputed world heavyweight champion Evander Holyfield, former heavyweight champion Bruce Seldon, and former light heavyweight and cruiserweight champion Virgil Hill. Other Fighters in attendance included Shamone Alvarez, Patrick Majewski, and Thomas LaManna. Counter right hand by Muhammad dropped Rivera in the second round. Muhammad, now 6-0, returns to the ring after a two year layoff. Left hand to head in third by Bembury had Seldon in big trouble. Mateen used the rope-a-dope on Harvell, who threw jabs at a distance and did not get suckered into the trap. Mateen landed all power shots when he did counter. 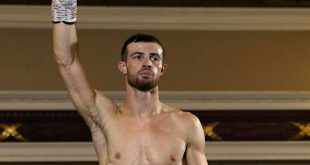 Dublin, Ireland Hardwick and Bolar both slipped to the canvas in the first. Bolar on his back from a right in third got up and took a beating from Hardwick.